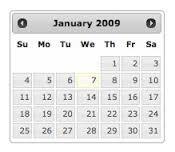 In this article we will see how to display week of year in jQuery DatePicker. In order to achieve this we need to set boolean property showWeek to true. We can also set the day of week to display the dates. Thus by setting the boolean property showWeek to true, we can also display the week number.